In the Summer of 2006, I went on a road trip with 4 of My friends, we drove from Berlin all the way down to somewhere in the middle of Croatia and back again. It was one hell of a trip, cause we hadn’t planed anything, and it turn out that we all had different ideas of what the trip was all about, and sure enough we had our arguments, at one point I was ready to go to the nearest train station and take the next train home. This makes It sound like it was a really bad trip, but looking back at it today, I it wasn’t that bad at all, there where many great moments as well, but I learned that if you are going on a road trip with more the 1 person, you really need to sit down and talk about what the trip should be like, you don’t have to plan it in minor details, but definitely sit down and have at talk about it. 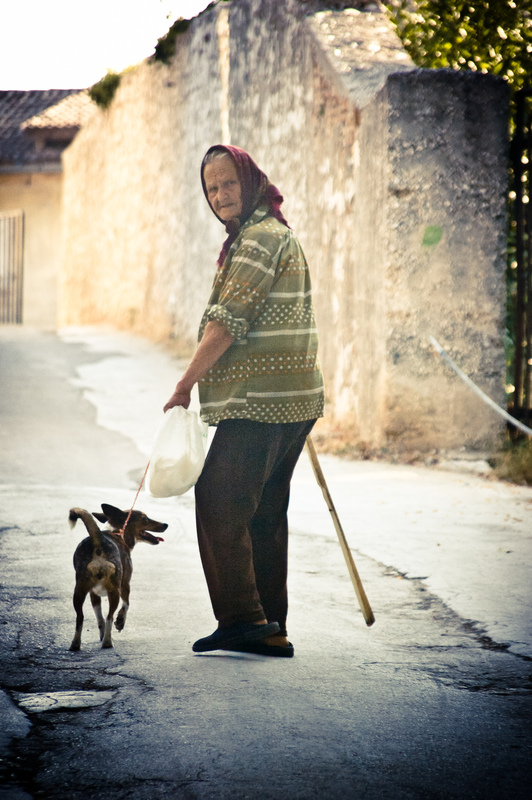 This shoot was made in the small – and very cozy – Croatian town Rovinj, I was just walking around enjoying the hot weather, when I saw this lady walking her dog, she was walking up this small road,and just as I started shooting some pictures, she turn around as if she could hear the shutter clicking. Lucky me, cause that made the shot that much better. Stop Following Me – Polaroid Plate #14 by Bo47 is licensed under a Creative Commons Attribution-NonCommercial-NoDerivatives 4.0 International License. Previous articleWashington's Old WagonNext article What's That?